Britain doesn’t exactly have a great reputation when it comes to barbecue. I think a lot of it has to do with the trials and tribulations of the classic British summer… Hopefuls out in full force with their makeshift bbq sets, only to be rained on even before the charcoal gets warm. It’s no wonder there isn’t that same barbecue-obsessed culture like there is in Texas or Kansas City where there are world class bbq pits producing melt in the mouth pulled pork and slow-cooked baby-back ribs at every corner. Jamie Oliver and Adam Perry Lang‘s latest venture @ One New Change seeks to change all of that. The Philosophy of the food at Barbecoa is about bringing out the best in produce using charcoal, smoke and fire cooking techniques from all around the world. Their state of the art kitchen features Texan smokers, Robata grills, a bbq pit… heck even Tandoori ovens. It’s safe to say there won’t be any wet weather putting dampers on your barbeque here. 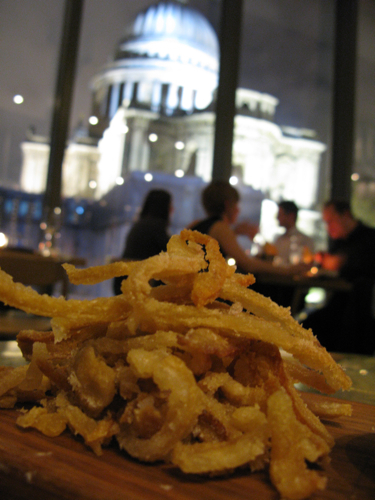 As soon as you walk into the L-shape expanse of Barbecoa’s dining area, its impossible to miss St Paul’s towering in the background through their floor to ceiling windows… it’s quite the postcard picture sight. For a place that looks like it can easily seat north of 120 covers, its already operating like a well-oiled machine – bluetooth radio sets linking front-line ushers to waiting staff and wireless devices zapping orders straight to the kitchens. And what of the food? Their Pork Scratchings with Mole which we opened with was an interesting spin on the usual bar snack-nibble. The sweet-chocolatey heat of the Mole complementing the savoury crunch of the scratchings extremely well. 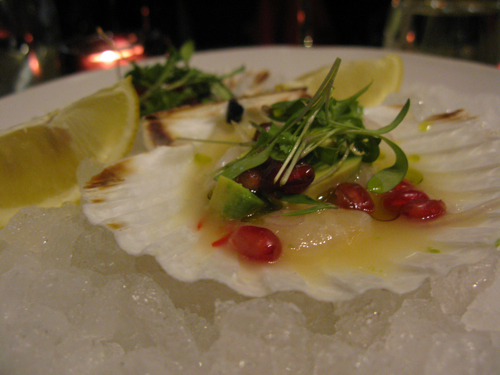 Scallop Cerviche which was served in-shell on a bed of ice and cured in a yuzu lime-chilli-garlic sauce was a fresh, zingy starter that got the salivary glands working. However, it wasn’t quite large enough to justify it’s £11 price tag. The pulled pork they do here though is mind-blowingly good. Served with a crunchy red-cabbage slaw and jalapeno cornbread, the meat melts away in the mouth like velvet… then comes the punch and right hook from the home-made barbecue sauce. Comfort food extraordinaire and quite simply the best pulled pork I’ve sampled to date this side of the Atlantic. I was left wanting more (much more). 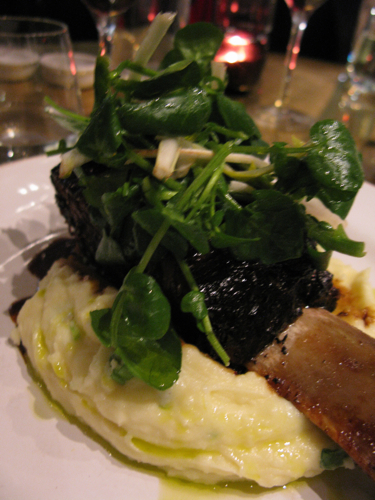 Jo opted for the Worcestershire-glazed Short Rib, served on a bed of Irish Champ and topped with blanched Watercress. A much more generously-sized portion than the pulled pork, you could easily flake the slow-cooked meat straight off the bone. After the joy of the first few carnivorous bites though, the rich-smokiness of the meat did start to feel a bit tedious and one-dimensional… missing that secret ingredient or spark from a side-dish to lift it. A tall Sundae glass worth of homemade Vin Santo ice-cream (£6) brought a comforting end to proceedings. 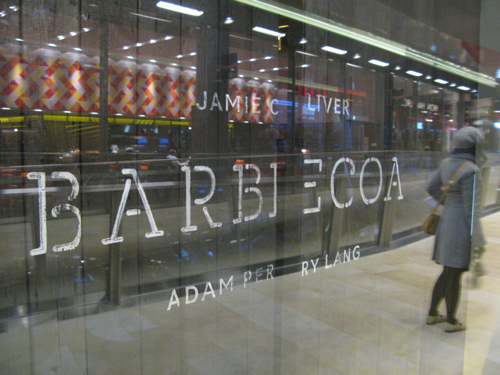 On the whole, I’m glad Barbecoa has brought some variety into an otherwise dull Square-mile restaurant scene. But for what you get, it’s all a bit too pricey if you ask me. Britain definitely needs more places that pay homage to great barbecue – I’m just not sure barbecue was ever made to go down the posh route. With the damage at just under £90 for two (including a carafe of wine), the least they could do is give a little more pulled pork. I was immediately amazed at their butcher section where you can see all the cuts of meats but am not sure how good is Barbecoa. Seems a tad too pricey for me when craving for some BBQ! 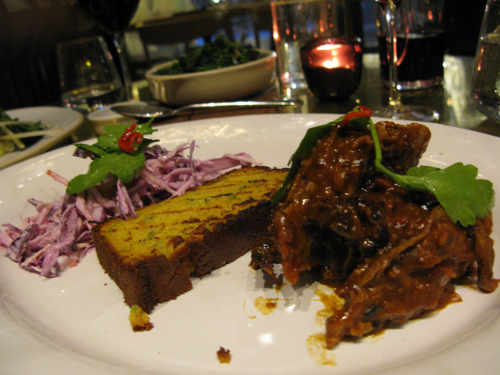 Kay: The pulled pork is seriously to die for… But as you say, I doubt I’ll be a regular at Barbecoa either as its a bit too much to pay for what you get. How I wish it was easy to find more affordable, down and dirty Barbecue shacks in London.